Who else watches the Oscars to drool over all the gorgeous, custom, unique and rare gems worn by all of the lovely red-carpet celebrities? This year definitely did not disappoint! We noticed a few trends that we’re excited to see taking to the streets. Here are a few of our favorites, and how to wear them off the red carpet. It seems like all the celebs this year were rocking some type of statement earrings. Each had their own personal style, and each looked fabulous flaunting it! Charlize Theron went big and bold with her statement earrings. 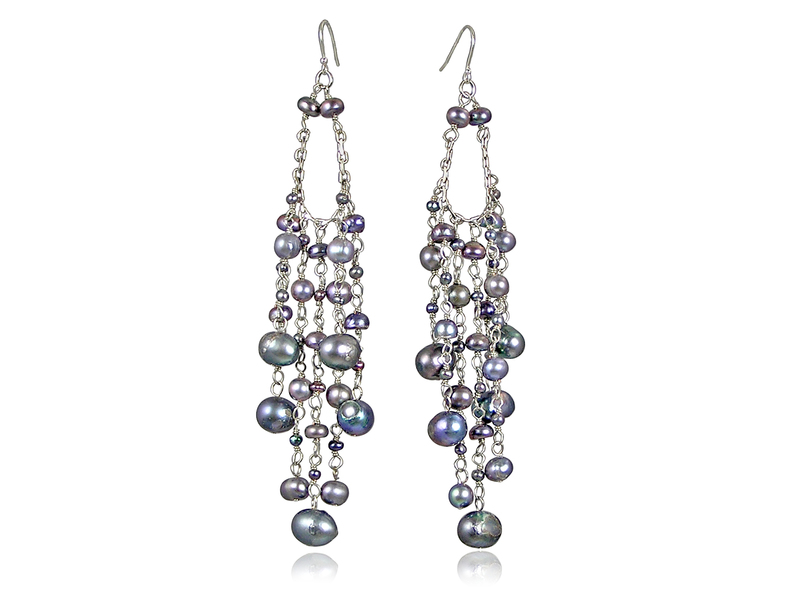 Style tip: if you’re going to rock earrings as dazzling as the ones above, definitely go with a bare neck as well. You don’t want your necklace to be in competition with your earrings, and if you’ve got a killer pair of statement earrings you’re dying to show off, then you certainly want to let them do the talking. 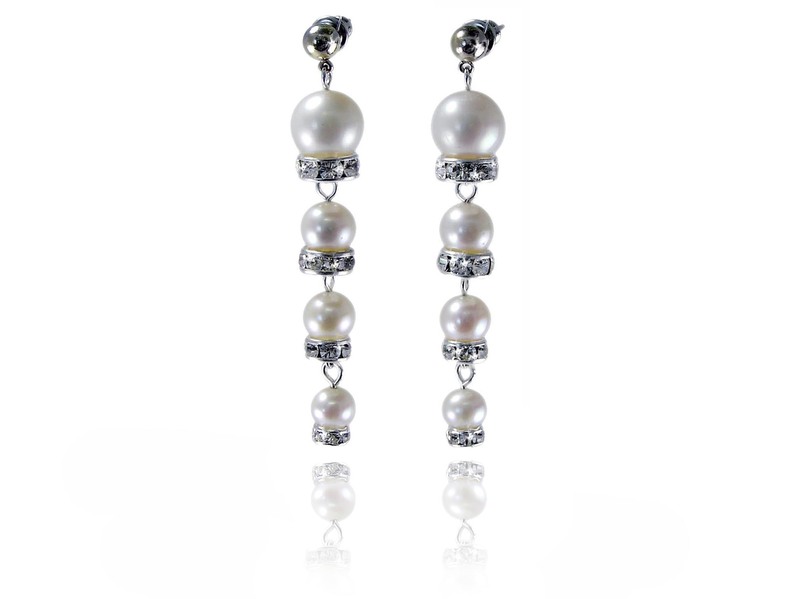 Pictured below: some of our favorite big, bold statement earrings available here at Pearls International. Emma Stone rocked a slightly more delicate, yet still impactful look with these beautiful diamond earrings. The best thing about these earrings is the movement they allow. The diamond sparkle is ready to catch your eye with each turn of her head. This is really a statement look that can work for everyone! 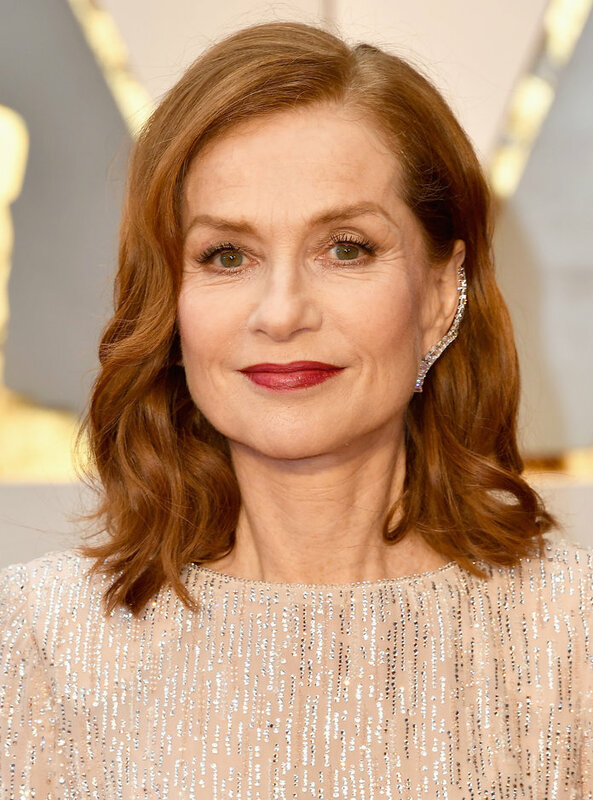 Isabelle Huppert shows off a dazzling ear climber. Ear climbers are something we’ve always been a fan of. 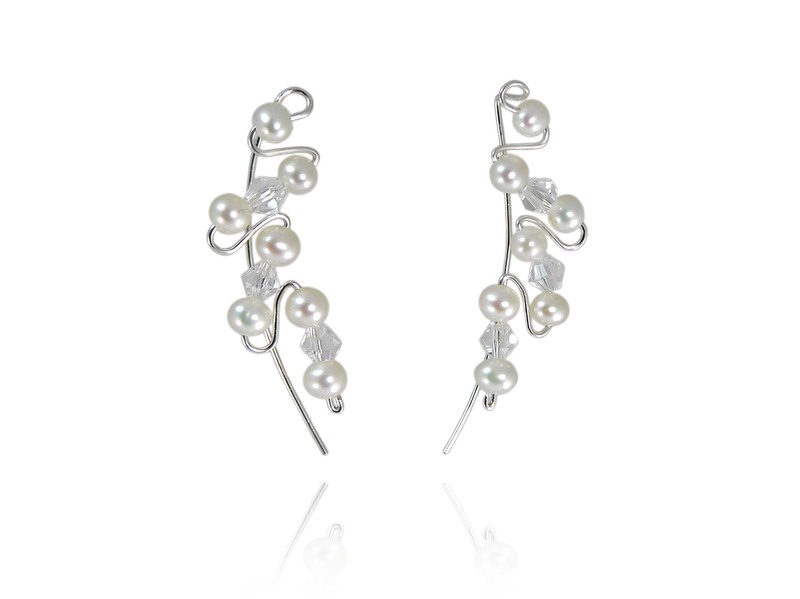 One of our most popular earrings are our pearl ear climbers, which can be worn up the ear like in Isabelle’s photo, or turned downward as a dangle earring for a different statement. 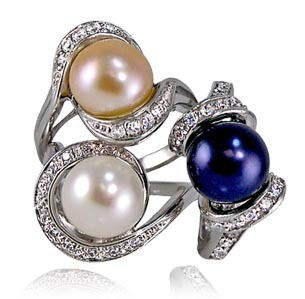 You can check them out in white pearls (pictured below) or black pearls. A few of the stars were wearing some awesome, fashionable bracelet combos this year. Often bracelets are overlooked in favor of flashy necklaces, but we thought they definitely deserved a mention. Two big style trends we saw on the red carpet this year were layers of similar bracelets on one wrist, like Halle Berry’s (pictured below) and big, bold cuffs like the ones worn by Priyanka Chopka. The cool thing about this style is that you can make it as casual or dressy as you want. Stack delicate pearl bracelets with diamond bands or some of your other favorite gemstones for your own version of a red carpet look, or try pearls and leather or simple chain bracelets for a more casual stack. There are so many ways to showcase your own personal style with this look! We just love Priyanka’s look here – the symmetry of her matched cuffs and how it compliments the unique texture of her dress, and of course the statement earrings! You can click here to shop some bracelet inspiration of your own. Are you more of a Priyanka or a Halle when it comes to bracelet style? Tell us in the comments! This is a timeless red carpet look but one that never fails to amaze! Rather than wearing huge, heavy necklaces, these celebrities wore statement pieces in a choker length. Their individual styles shine through here as well. 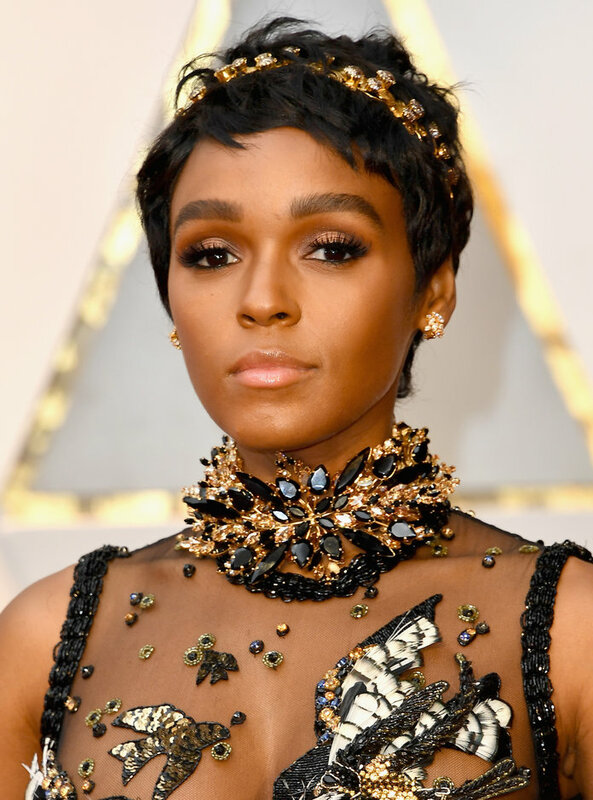 Janelle Monae has an over-the-top look going on here – but it totally works for her! The whole outfit has the effect of making her look like something out of a fairy tale, but we can’t help to be drawn to that incredible choker. 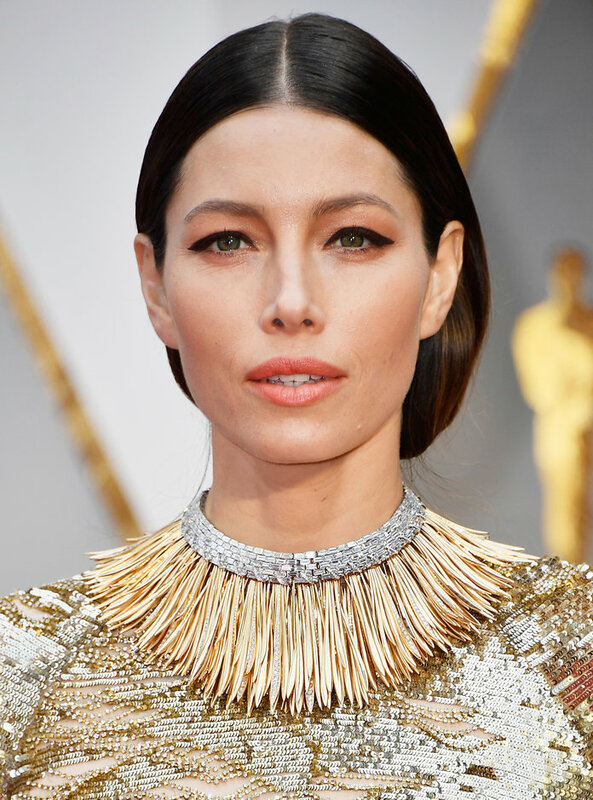 Jessica Biel’s runway style also included an elaborate choker. This one was handcrafted by Tiffany and Co. Gorgeous! Alicia Vikander and Taraji P. Hensen are just two examples of dazzling diamond chokers worn at the Oscars this year. Both styles are elegant and absolutely flattering. Look for a statement necklace of your own here! 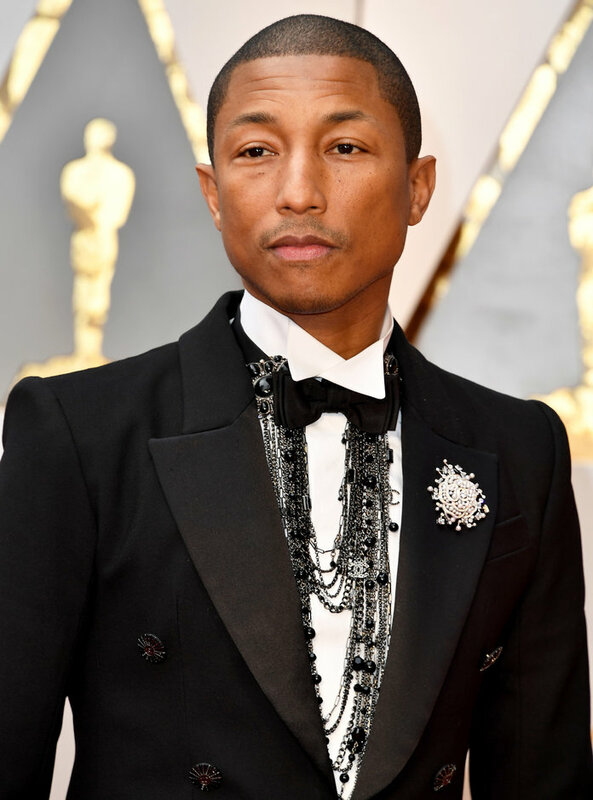 Pharrell Williams was killin’ it in these layered necklaces and elaborate pearl brooch, proving once and for all that pearls are for everyone! Welcome in 2017 and the New Color of the Year, Greenery! ground-breaking decision last year by choosing two colors instead of just one for their iconic color of the year slot, but as all good things must come to an end, so must last year’s trend. This year we are welcoming in “Greenery.” Greenery is the perfect symbolism for a promising new year, as it is meant to evoke feelings of springtime, renewal and freshness. 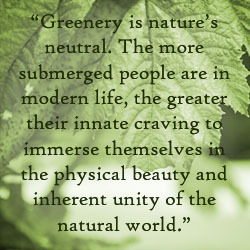 It’s no secret that 2016 was a rough year for a lot of people, so the vitality, passion, and affirmations that Greenery symbolizes can be seen as a reflection of what we all are hoping for out of the new year. The bold, bright yellow-green tone is a refreshing change from the serene, pastel colors of last year. Even better, Greenery itself seems to go with just about everything. Wear it as a bright, earthy addition to your neutrals or deeper shades. It’s even just light enough to be a daring compliment to pastels. Our favorite Greenery pairing? Idocrase – a rare volcanic mineral very similar to Jadeite and Nephrite jades, but in a lighter chartreuse to lime green color range. This material is found exclusively in a remote area near Hermosillo, Mexico, and was used in decorative jewelry and ornaments by the local natives of that area. Idocrase is also known as Aztec Jade, Vesuvianite, Californite, California Jade, Caribbean Jade. Click to shop our Aztec Jade collection! One thing my mom and I like to do when we get together is show off our newest jewelry acquisitions. My mom has quite the impressive ring collection, and I like to go through her jewelry box and try everything on during my visits. I’ve inherited quite a few stunning pieces of jewelry this way! On my last visit, she showed me a new ring she had recently picked up and thought I would love. She said it was a pink amethyst. Now, amethyst is my birthstone and I have a couple pieces already (and I love to drool over and try on the stunning amethyst jewelry we have here at the shop) – but I’d never seen or heard of pink amethyst before. By definition, amethyst is a variety of quartz, found in shades of light lilac to deep purple. 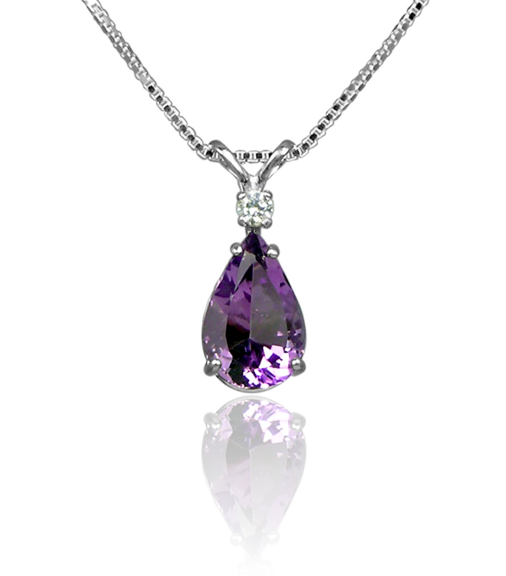 When the average person thinks of amethyst, it’s usually a color like the pendant below that comes to mind. So, wouldn’t “pink” amethyst be rose quartz? I decided to do some research on this “pink amethyst” to find out if it was a jeweler’s marketing trick, or if it was in fact true amethyst. The first thing I discovered along my quest for gemstone knowledge was that there is an actual difference between “pink” quartz and “rose” quartz. Pink quartz, evidently, is more valuable than rose quartz. Pink quartz is the name given to quartz of this shade when found in crystal form, while rose quartz is never found in crystal form and is much less transparent than pink quartz. 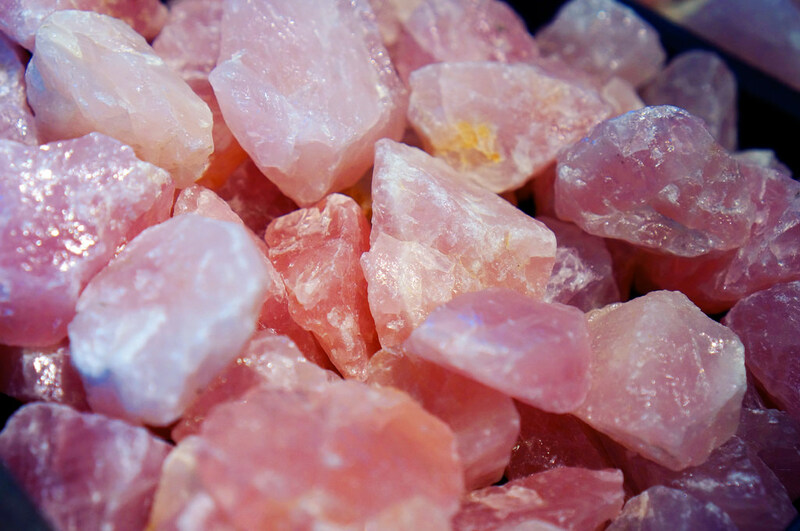 Also, pink quartz and rose quartz are found in different environments and have different care recommendations. For example, pink quartz is sensitive to light, while rose quartz is not. I knew after a few quick minutes of research that my mom’s ring was more than likely not rose quartz, as it is vary rarely found in facet grade material. In fact, rose quartz is usually sold in bead form. An example of rose quartz in the rough. The second thing I learned was that there is also a stone commonly called “green amethyst.” Green amethyst is, in fact, a misnomer for prasiolite. Prasiolite is a greenish color variety of quartz. Certain deposits of amethyst can be heat treated to achieve this color, and on rare occasions amethyst can become heated naturally within the earth’s surface, creating natural prasiolite deposits. However, most prasiolite is created by manipulating amethyst. 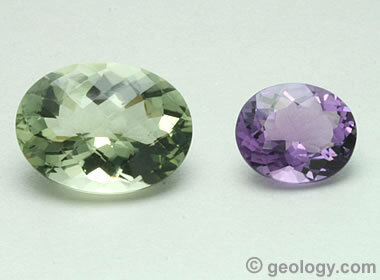 Prasiolite, sometimes called “green amethyst” next to true purple amethyst. I began to wonder if pink amethyst, like green amethyst, was also a misnomer. While researching this possibility, I learned of a popular amethyst variety called “Rose de France.” Rose de France is the name given to the palest of amethyst, often a pastel lavender in color. 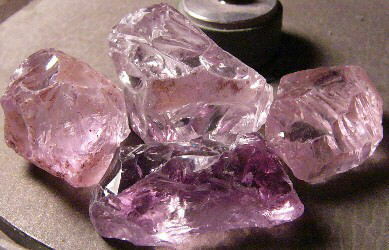 It is mined in certain regions in Brazil and may contain lower iron deposits than deeper amethyst stones. Rose de France can sometimes appear pink. I wondered if this was the answer I was looking for! This, to me, serves as a reminder to know what you’re looking for and not to be swept away by catchy marketing phrases. You should always try to find a jeweler you can trust, and be assured that if you’re buying jewelry online that you can return or exchange it if it doesn’t live up to your expectations. At Pearls International, we offer a 100% Satisfaction Guarantee and One-Year Warranty on all of our items so that you can always shop with confidence. And, if it’s a pink stone you want, you should probably look for pink diamonds, pink tourmaline, or pink sapphire, which (while they may be a little more pricey than pink amethyst) are going to be more true to color. 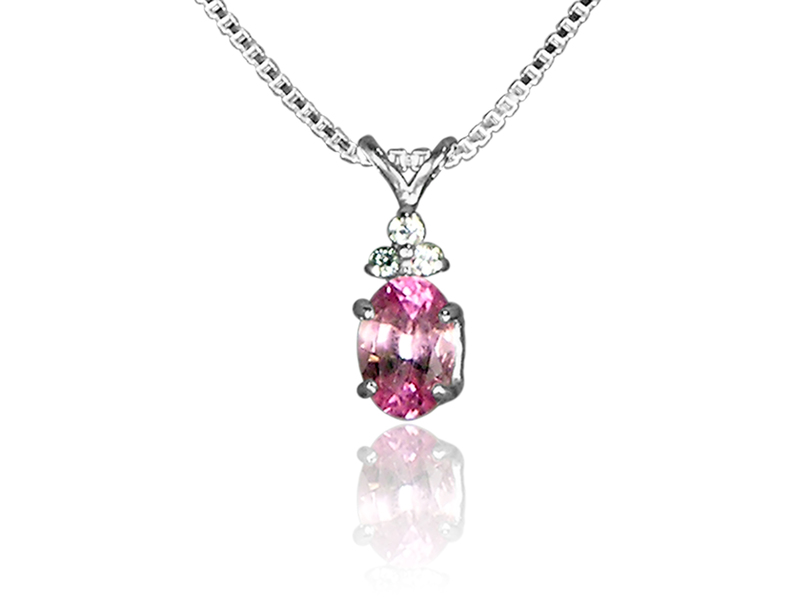 Pictured above: a Pearls International Pink Tourmaline Pendant. October is Right-Hand Ring Month! I don’t know about you, but I’ll take a reason to celebrate anything, any time. Especially if it’s jewelry-related! So when I found out that October is the official month for celebrating right-hand rings, I couldn’t wait to post this and tell you all about it! How can you celebrate? First, check out our dazzling selection of rings. They will be on sale all month! Second, post a picture of your favorite Pearls International ring on your right hand on Instagram or Facebook and tag it #OctoberRingContest for a chance to win a goodie bag! Goodie bags contain some lovely stuff to keep your rings looking great all year – our special pearl-safe cleaner, a polishing cloth, and a jeweler’s loupe (useful for checking prongs). When tagging on Instagram – be sure to use our handle @pearlsinternational so we can find your post. Keep in mind that we won’t be able to see your image if your account is private. The winner will be chosen via a blind drawing and announced on social media on Friday, November 4th. Summer might be ending, but hot weather sure isn’t going anywhere yet. When you live in Florida like we do, you get to experience summer all year ’round. This has its high points, and its lows. With this being one of the hottest years on record, it’s almost unbearable to go outside in anything other than a sundress or your beach wear. In conditions like these, it’s easy to end up in a bit of a fashion rut – when you only have so many summer worthy outfits in your closet, you run dangerously close to repeating your #OOTD posts on Instagram. Boring! So how to spice up your look? Accessorize, of course! 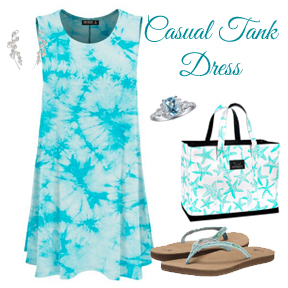 We’re here to show you what to wear with all of your sundresses to brighten up your summer style. This one’s easy. 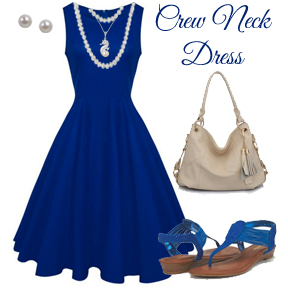 Wear a simple pendant that highlights the cut of your dress. Minimalist styles look best with this type of sundress, so pick a pendant that has one of the colors from your dress in it and isn’t too elaborate. Make sure not to wear a necklace that’s too long; you don’t want your pendant getting lost in your cleavage. We went for a red theme with the dress below, but you could also choose to accent the black designs with some black onyx or black spinel instead of garnet. Use the colors in your jewelry box to your advantage! The right jewelry selection can completely change the personality of your outfit and really spice up your wardrobe. With a crew neck dress you have a lot of possibilities. Since most of your upper body will be covered, layered necklaces look great with this style. You have to opportunity to wear jewelry that would usually detract from the rest of your outfit, and instead it complements your look! Might we suggest a pearl rope for layering? You can wear it long or double it up to make it shorter, and add a couple of your favorite pendants or other necklaces of different lengths for a trendy and personalized look. The sweetheart neckline is the perfect cut for showing off a choker length necklace. You can mix it up depending on the day, too. Go with a large, chunky, or sparkly necklace to make a statement or style your dress with something more delicate for a softer look. In the picture below we’ve created a more dressy look, but the same outfit would look great with more casual accessories as well! For a strapless dress, statement earrings are the way to go! Necklaces can sometimes throw off the look of the straight neckline, and you’ll want to draw some attention up towards your face. You can personalize your look further with a trendy clutch or handbag, and a statement ring to balance out the heavy earrings. Think about what kind of themes you can you create with the jewelry and the clothes that you own: in the below example, we used black peacock pearls to compliment the peacock feather design on the shoes. Tell us what you think! Did you like our style edit? What fashion savvy advice do you have for staying in style in this heat? Watch Out Peridot – August Has a New Birthstone! If you’ve followed our birthstone blog series or read any of our gemstone spotlights, you’ll know that we love reporting on all the dazzling and little-known facts about all of our favorite stones. August, which formerly could only claim peridot (and the lesser known sardonyx) as it’s birthstone, now has three stones to call its’ own! June, October, November, and December all boast more than one stone as a traditional birthstone, as well. In addition to peridot, those born in August can now sport lovely spinel as their birthstone. Spinel has been confused with ruby for many years, even in Europe’s crown jewels. You may have heard of the famed “Black Prince’s Ruby” – worn by royals since the 14th century. This stone is not a ruby at all, but a 170 carat spinel polished into an irregular cabochon. Other famous spinels include the nearly 400 carat spinel atop the Russian Imperial Crown, and the Samarian Spinel, which is an astonishing 500 carats and thought to be the largest gem-quality spinel in the world. It belongs to the Iranian Crown Jewels. 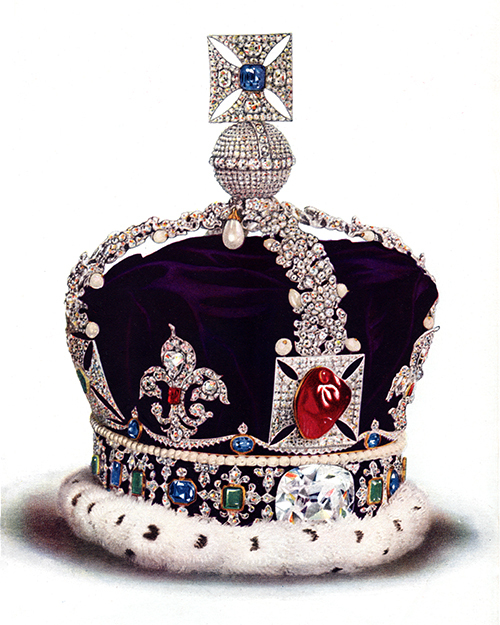 The Black Prince’s Ruby – one of the world’s most famous spinels, at the forefront of George V’s Imperial State Crown. It has since been remade into the modern, lighter crown. As you would expect from the great ruby impostor, the most prized color for spinel is red. A quality it shares with true rubies, spinel takes its vibrant red color from chromium. It is also available in blue, pink, and orange, as well as lavender and violet ranging through to bluish-green. It is even found in brown and black. 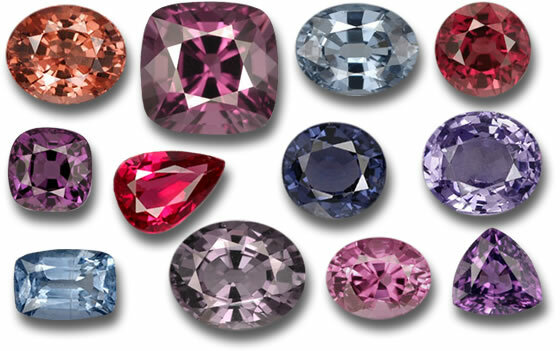 The variety of colors has contributed to its recent popularity, putting it in the same category as sapphires and garnets – two other popular stones known for their dazzling array of colors. Spinel is mined in Burma, Sri Lanka, Tanzania, parts of the US, Australia, and Tadzhikistan to name a few areas. It is actually rarer (and more affordable) than many rubies! Pieces larger than 5 carats, however, are considered quite rare – especially in ruby red and cobalt blue (which resembles the most prized shade of sapphire). These are the two most popular colors. Spinel is often imitated due to its’ resemblance to many other stones. True spinel contains iron, which makes it slightly magnetic. This separates it from the synthetic stones, although all reputable jewelry dealers should label their products clearly as natural or synthetic. Spinel also differs from rubies and sapphires in that it doesn’t rank quite as high on the Mohs hardness scale. However, it does still claim an 8, which makes it good for most jewelry applications. 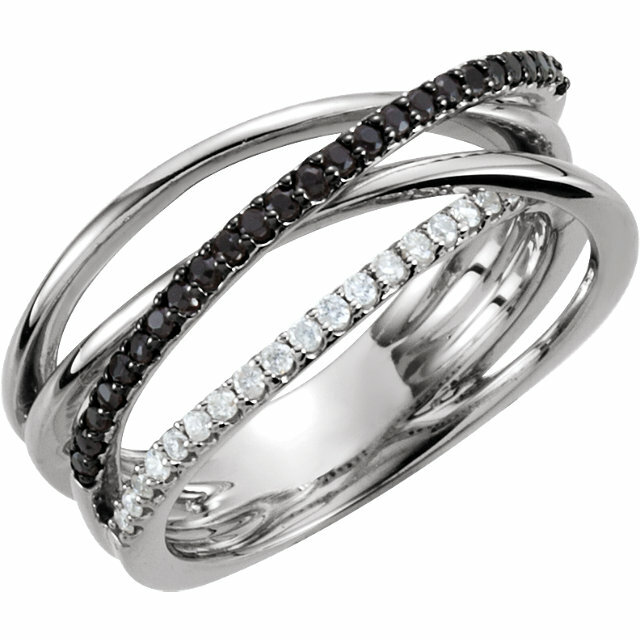 Spinel is said to contain many metaphysical properties, which vary depending on the color of the stone in question. Overall it is said to be a calming stone and is recommended to those suffering from stress. When broken down by color, red spinel is said to enhance vitality, while green and pink incite compassion and love. Yellow has ties to intellect, while violet has associations in spiritual development. Nothing says disappointment like wearing an amazing new piece of jewelry for a few days, only to have it irritate your skin. The first step in fixing this pesky problem is to find out what exactly is causing your skin to feel irritated. Is there a rough edge somewhere on your jewelry rubbing your skin uncomfortably? Is your ring too tight? Could you have a metal allergy? To determine the issue, examine your jewelry first. Check for any rough spots. Your jeweler should be able to grind down any rough or sharp edges on your jewelry that may make your skin feel irritated. A ring that is too small may rub uncomfortably against your finger, understandably causing irritation. Often, you might not even notice that your ring is getting tight, especially if it is one you wear all the time. In the summer time, your hands can swell, causing your ring to irritate you. Try wearing your ring on another finger for a few days to see if it feels any better. 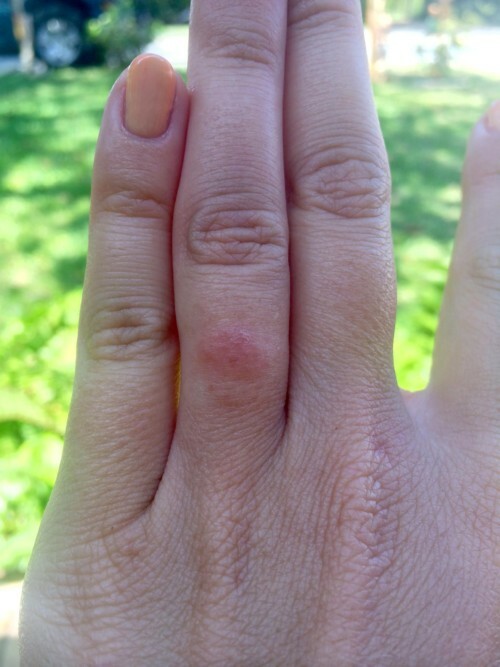 Skin irritation caused by a ring. If none of these things apply to your situation, you most likely have a metal allergy. The most common metal allergy is nickel, which is used in white gold and Sterling silver. However, every body is different and people can be allergic to all kinds of metals. If you have an allergy, try borrowing some pieces of jewelry (preferably rings, since they come in the closest contact with your skin) in different metal types to find a material that won’t irritate you. Many of the pieces in our Seaside Collection are made with imitation rhodium, a metal that is hypoallergenic and non-tarnishing. But, this piece of jewelry has never irritated me before! It sometimes happens that we develop new allergies as we get older. Also, your jewelry could have been plated. Many pieces of silver color jewelry are plated with Rhodium or another white metal. Plating will eventually wear away over time, exposing you to the base metal of your jewelry, which is what is most likely irritating you. This can usually be fixed by having your jewelry re-plated, although keep in mind that you may need to do this regularly. It should also be noted that you should keep your plated jewelry away from soaps, lotions and other personal care products that may cause the plating to wear away sooner. If you’ve worn pendants or bracelets of the same metal, it might not have irritated you because it wasn’t as close to your skin. Bracelets slide around on your arms a bit, and pendants are often protected from direct contact with your skin by a layer of clothing. You’re most likely to see irritation from rings or earrings. Okay, so I’m allergic to my jewelry. Now what? You definitely have options. As stated above, you can have your jewelry plated. For mild allergies, keep your skin dry where metal comes into contact with it. The trapped moisture allows metal ions to be absorbed into the skin more easily. 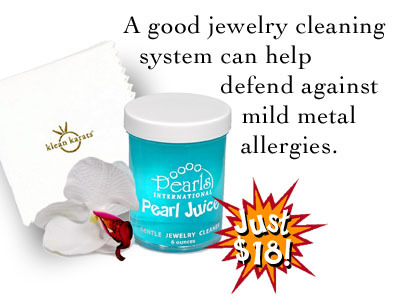 Another thing you can do is keep your jewelry clean and tarnish free. Also, wearing your jewelry for shorter lengths of time may help. If your irritation is a little more intense, you can also choose to have your jewelry redesigned. This may seem scary, but it could be an exciting opportunity to upgrade your piece. Our talented custom design specialists would love to consult with you and create a design for you that will set your heart fluttering. We will even use your original stones. If you’re just not into the idea of having your beloved piece of jewelry transformed into something new, we can cast an identical copy in a more suitable metal. Ideally, we recommend platinum for those with sensitivities, as you are the least likely to have an allergy to this material. Rhodium is also a good choice for many people. 24k yellow gold is also a good choice, as it contains the fewest alloys. Fill out the form below or contact Pearls International Customer Care at 386.767.3473 or email us at customercare@pearlsinternational.com to request a repair envelope for you to send your irritating jewelry in to our experts for plating or redesign. We’ll be happy to answer any questions you might have! Comments about your repair(s), special instructions, etc. Today’s Gemstone Spotlight will leave you feeling green with envy! Jade is known for its striking green color and exceptional toughness. But did you know that jade comes in more colors than just green? While green is the most valuable, jadeite is also found in yellow, red-orange, white, gray, black, brown, and light purple. Nephrite, another variety of jade, is found in yellow, brown, black, gray, or white in addition to the classic shades of green. Throughout history, Jade was valued for its toughness. 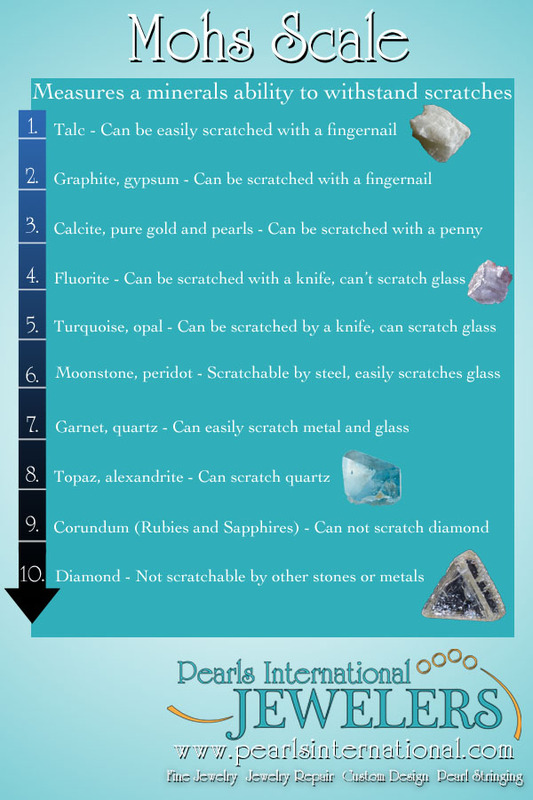 While it ranges from a 6-7 on the Mohs scale, it is a very durable gem and was often used to create tools and weaponry in several different cultures. The mineral buildup of Jade makes this possible, as both jadeite and nephrite are metamorphic rocks composed of tiny, interlocking crystals. So if it doesn’t get very high marks in hardness, how is it valued for being tough? Interestingly enough, hardness and toughness are tested very differently in the jewelry industry. 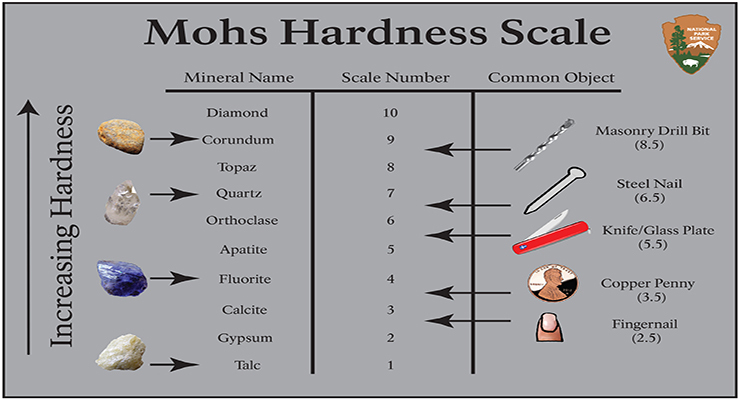 Hardness (as measured on the Mohs scale) ranks the stone’s ability to withstand scratches and indentation, while toughness judges the stone’s ability to withstand breakage. This is why jade rings may become scratched over time, but ancient Chinese jade sculptures still stand unbroken. 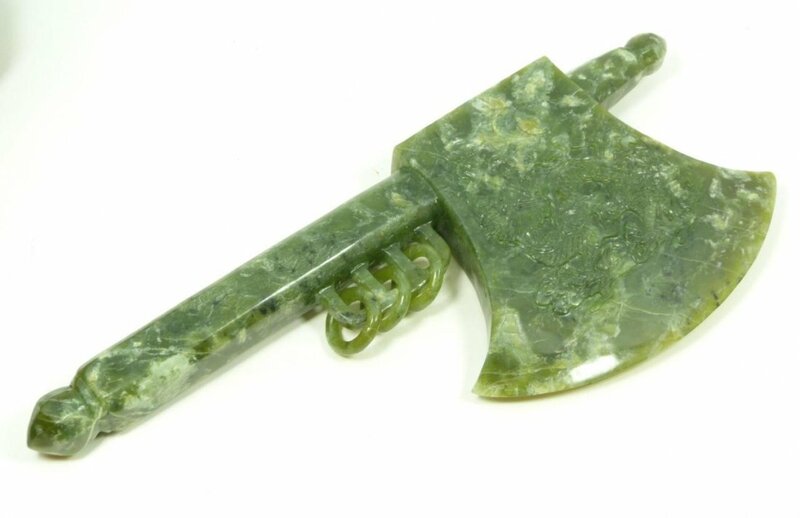 A Chinese ceremonial jade axe. 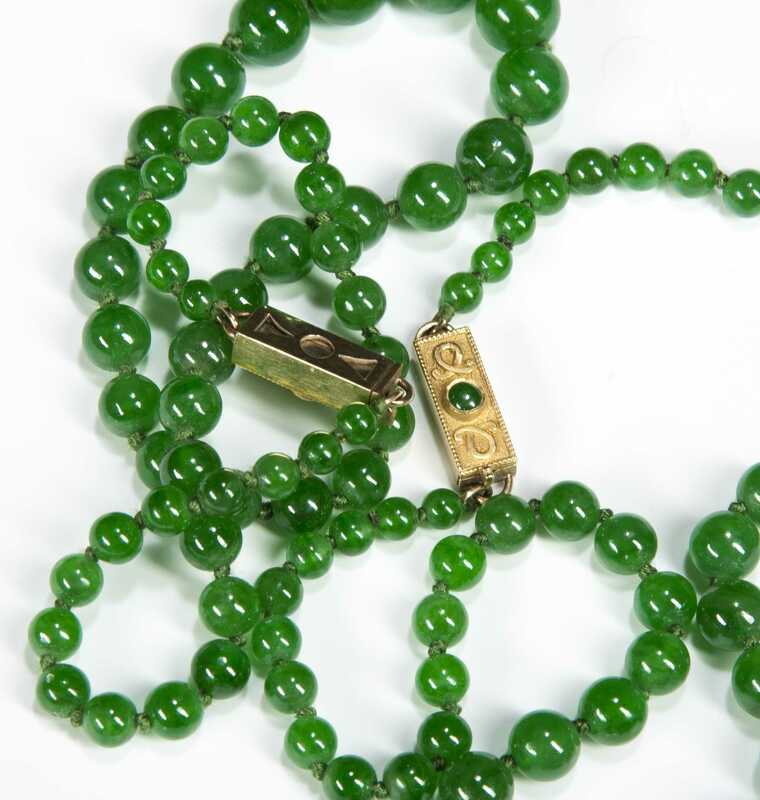 In a jewelry application, jade is typically beaded or polished into a cabochon. It is rarely faceted. 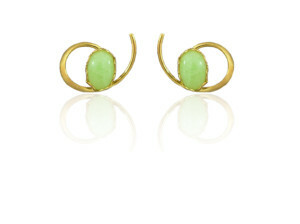 When polished, jade should have a glassy to oily luster. This stone is popular in both men’s and women’s jewelry. It is most commonly seen in rings in cabochon form and carved into beads or discs for necklaces. In the east, the most popular piece of jade jewelry is the carved jade bangle, which is thought to bring protection to the wearer. 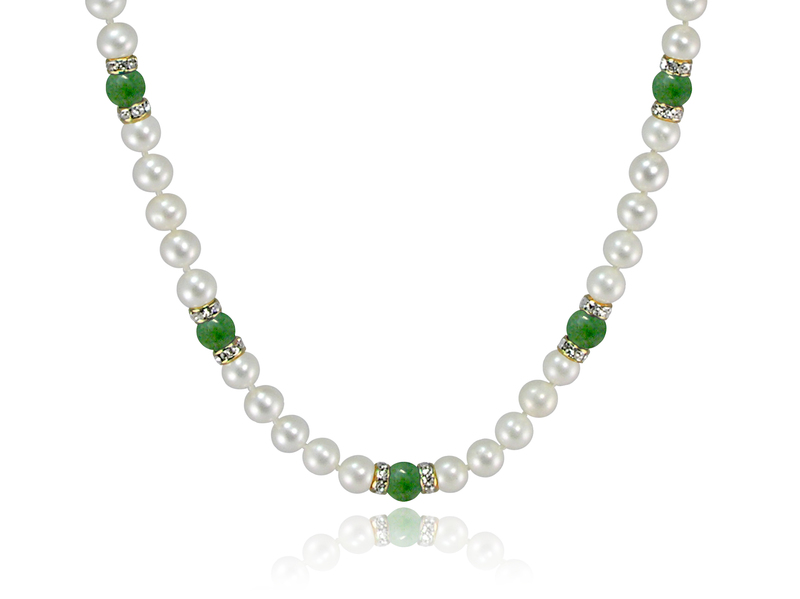 At Pearls International Jewelers, we have stunning pearl and jade pieces in our Dream In Color Collection, which uses traditional jade beads strung together with pearls in necklaces and bracelets. 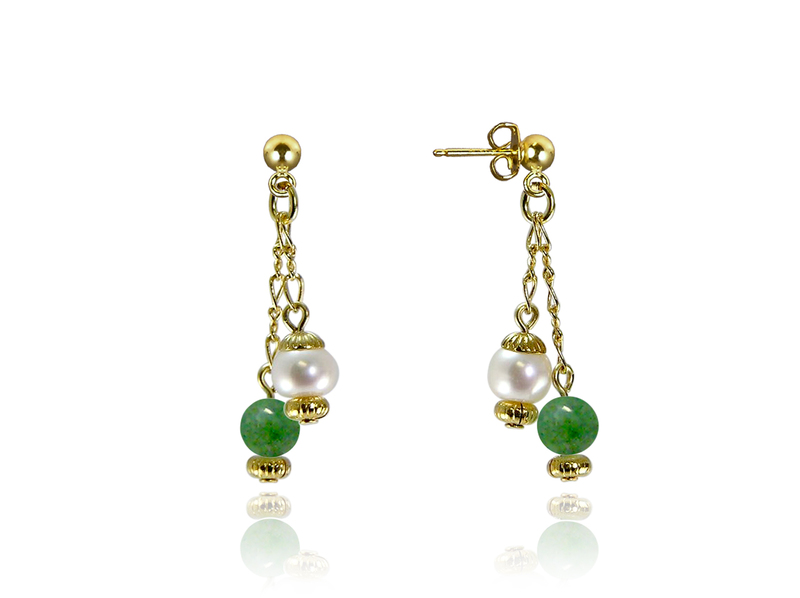 We also have lovely jade earrings. Jade beads with white freshwater pearls and Swarovski crystal rondelles. 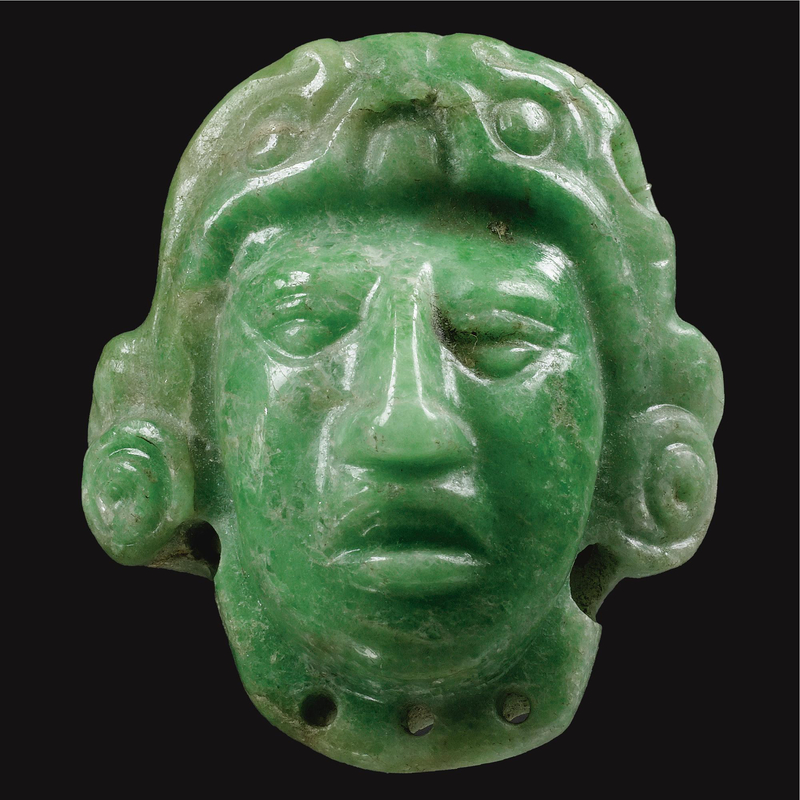 Aztecs and Mayans believed jade could cure pain in the side of the body. In fact, the name jade came from Spanish explorers calling the gem “piedra de ijada,” literally meaning stone for pain in the side, which they coined while observing these cultures holding jade pieces up their sides. It is also thought to bring good luck and prosperity. 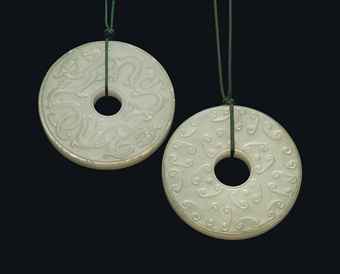 Two Chinese bi discs made of carved white jade. Perhaps the culture in which jade has the greatest value is China. The Chinese believe jade encourages longevity and strengthens your health. Meaningful sculptures are carved from jade all over China, giving it further meaning. A popular example of this is the traditional flat disc with a hole in the middle, known as “bi” in Chinese, a symbol of heaven. Other common Chinese jade sculptures include butterflies, which symbolize a long life, and dragons, which represent power and prosperity. 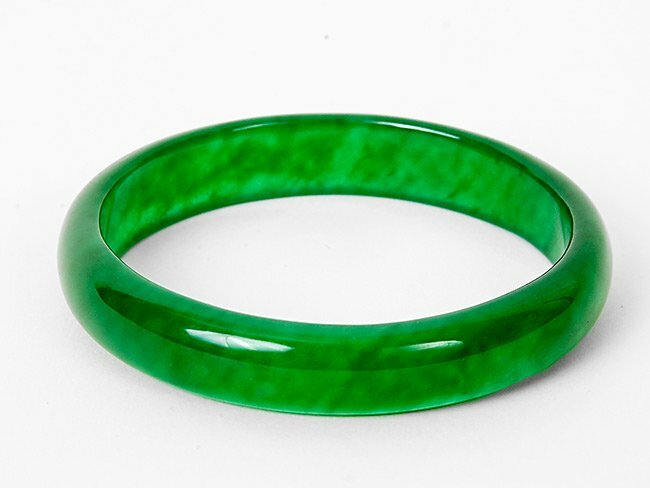 A bangle carved from imperial jade. In many stories and legends, the popular jade bangle of eastern cultures (particularly China), was accredited with miraculous recovery from illnesses. It is said that the bangle would break at the critical moment and the wearer would recover as a result. In similar tales, the wearer of a jade bangle would emerge from an accident uninjured if the bangle broke at the right time. Both varieties of jade are found all over the world. 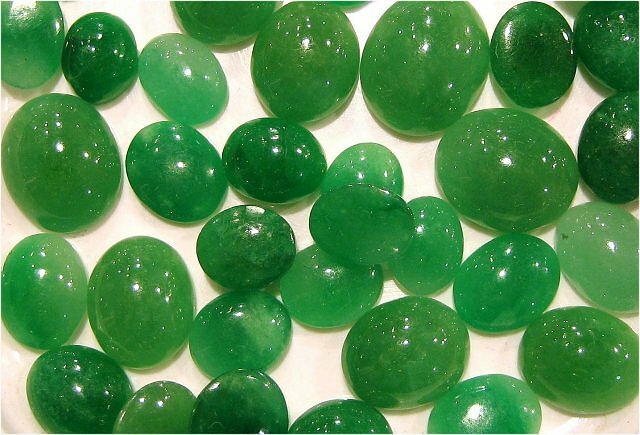 Nephrite is more commonly obtained and therefore slightly less valuable than jadeite. The most valuable variety of jadeite, called imperial jade, which is prized for having a brighter, bolder green hue than the other varieties, is only mined in Myanmar (formerly Burma). Jade may also be found in China, Japan, New Zealand, Canada, Russia, and Guatemala to name a few known deposits. Necklaces made of imperial jade. Jade is the traditional gift for a 12th wedding anniversary. It is also associated with the astrological sign of Taurus, so makes a meaningful gift for those interested in connection with their star sign. Jade is a wonderful every day stone which can be made into many different jewelry styles. Need a special gift for your upcoming anniversary or sweetheart’s birthday? Please contact us! 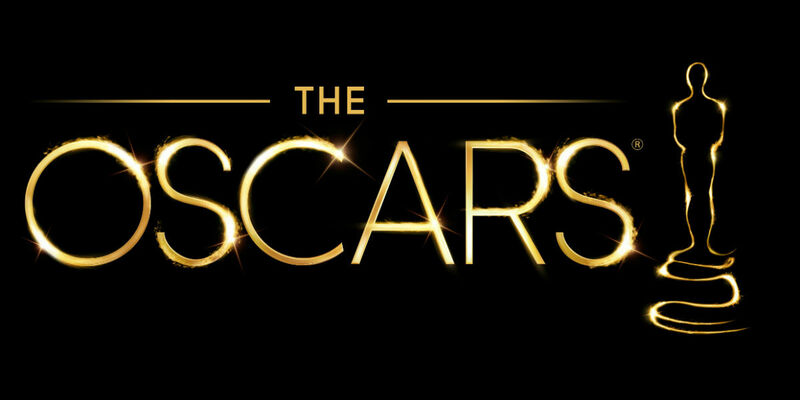 Jewelry Trends From the Oscars! Here are some of our favorite pieces from this years ceremony! Brie Larson looking drop-dead gorgeous! Check out that absolutely stunning pearl studded belt! 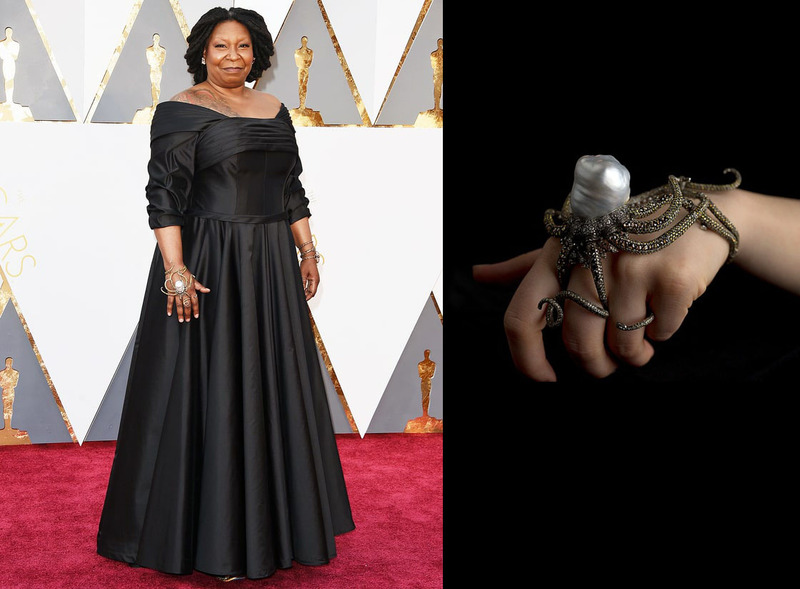 Left: The lovely Whoopi Goldberg wearing an amazing statement bracelet! The octopus bracelet she is wearing and the bracelet pictured on the right were designed by Sevan Bicakci. 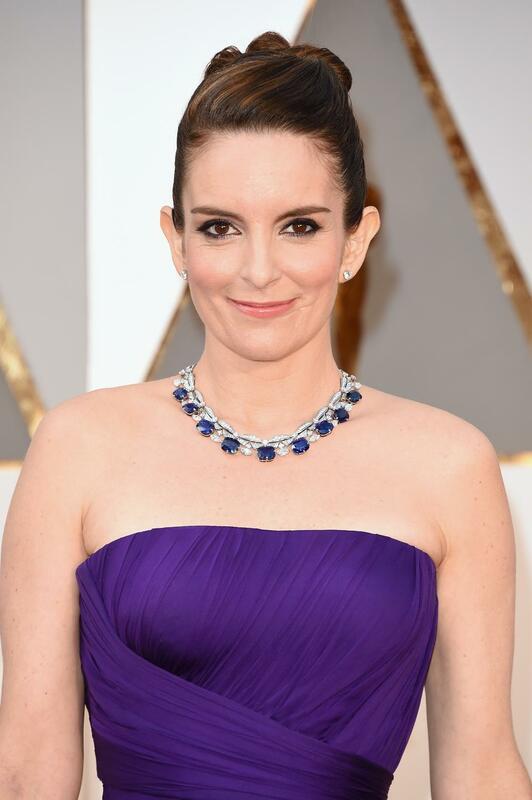 Tina Fey wearing a stunning Bulgari sapphire necklace. She seemed to be one of the few ladies sporting colored gemstones instead of white gold and diamonds, and we’re definitely into it! What were some of your favorite looks? Tell us in the comments!